Spring is finally here and it really is the best season! But it comes with some challenges. Your immune system may be weaker after the winter and we all feel less healthy and more sluggish. While the days get brighter and the evenings longer (depending where you live), there is a higher chance of catching a cold or flu in the spring than most other times of the year as we can be taken off guard. Your immune system is the most important part of your body when it comes to staying healthy and fighting off disease and illness. It works by detecting dangerous pathogens and viruses and protecting your body against them. 1. We don’t eat enough high-nutrient fresh food during winter. Yes, we may have supermarkets and all the exotic foods available all year long, but imported or last season’s produce is not as nutritious as fresh fruits and vegetables, and so our cells might start lacking the nutrients necessary for proper functioning. 2. The lack of sunshine lowers vitamin D levels in the body (unless you take supplements), which is essential to a healthy immune system. 3. Due to cold weather, we usually move less, eat heavier foods, and become lethargic during the winter, which in turn lowers the immune system. 4. Weather changes rapidly and temperatures fluctuate during the spring so many people with low immune systems face a perfect environment for the flu and various viral infections to flourish. Therefore it’s extremely important to pay attention to what you put in your body. In order to build a healthy immune system, focus on getting enough vitamin A, C, D and E, zinc, and fiber. 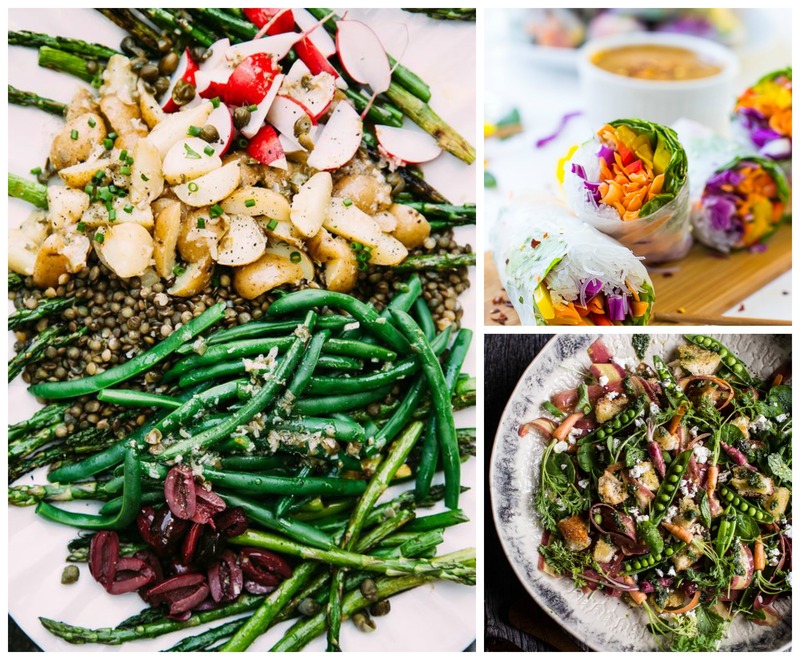 These mouth-watering spring recipes are full of these nutrients and will help you get healthy, radiant, and keep any illnesses at bay. This salad is scrumptious, juicy, crunchy, creamy, and zesty! It’s filled with antioxidants, vitamins A, C and K, iron, and healthy fats. These nutrients will not only help you boost your immune system but also give your skin a healthy glow. Rhubarb is only available for a short period per year, so make sure to make the most of it! It’s super high in vitamin C and minerals like calcium, copper, iron, magnesium, and potassium, all of which are essential to a healthy immune system. This salad contains almost everything that spring stands for: asparagus, new potatoes, green beans, chives and more! Lentils contain a lot of zinc which is vital for building a strong immune system. These rolls look like a spring celebration on a plate! So colorful, vibrant, and nutritious! Pasta can also be a healthy meal. It all depends on what you put on it. This one contains so many fiber-packed and mineral-rich veggies that it definitely qualifies as a healthy and nutritious meal. This salad looks like the ultimate Easter Bunny’s dream meal! And it’s far away from being boring as it comes with an interesting twist – carrot top pesto! Indulge in the creaminess and fresh spring flavors of this recipe! Did you know that peas are super high in protein and antioxidants, which prevents aging and promotes a healthy metabolism. This delicious baked oatmeal is so good for you, you can eat it either as dessert or as breakfast! It’s full of whole grain goodness and sweetened with a healthier type of sugar (maple syrup and a touch of coconut sugar) which is way healthier for you than the regular refined white version. Pick any of these throughout the season to eat, and you’re definitely going to notice a difference in the way you feel! It’s so easy to only eat comfort foods when the weather is cold, but if you can switch out a few meals for some of these great recipes, it’ll definitely make an impact on your health!